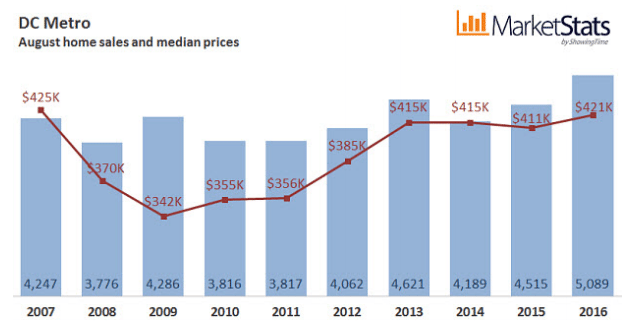 August was a banner month for Washington D.C. real estate, according to a new market report. Hitting multiple records, August saw rising prices and climbing sales in both the D.C. and Baltimore metro areas, a new report from MRIS says. D.C. home prices increased 9.8 percent in August from a year earlier to a median sale price of $576,500, according to a new Redfin report. August sales surged 24.8 percent compared to last year. Some of the sales surge may be attributed to closings that were pushed into August from July, which had fewer business days than normal.